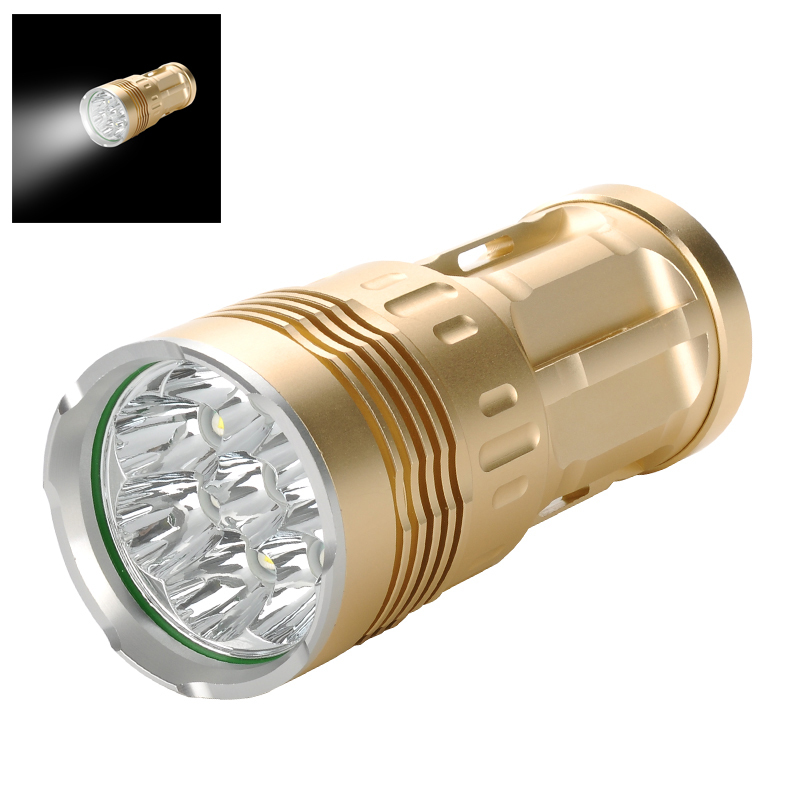 Successfully Added Skyray CREE T6 LED Flashlight - 6400Lumen, High, Med Strobe, 8 x Cree XM-L2 T6 LEDs (Gold) to your Shopping Cart. The Skyray Cree LED flashlight products 6400 Lumens bringing light to your life and expelling darkness wherever it shines. The Skyray LED torch is sure to light up your life with its 6400lumen output this bright white LED flashlight provides super hand held lighting for all indoor and outdoor needs. Everyone needs a reliable light source whether it's as a household backup for when there's a power cut, for use at the side of the road in case of a breakdown or just for taking the dog a walk. No matter your needs this compact flashlight is just the ticket as it takes up very little room yet stick packs an incredibly bright light. Made from Aircraft grade aluminum alloy this sturdy torch is made to last and thanks to silicon o-rings it has an IPx6 waterproof rating so getting stuck in the rain won't matter. This Cree LED flashlight is powered by 4 x 18650 rechargeable batteries for a strong constant performance and can illuminate your way for as much as 4 hours. With 3 different lighting modes (high, medium & strobe), available you can select the right one for your needs by simple pressing the click button on the side of this torch. Great for handheld tasks or even for hands free use as it comes with slots to attach a lanyard should you wish, letting you hand the light wherever its needed. great when working on the car or camping out at night. This 6400 Lumen flashlight comes with a 12 months warranty, brought to you by the leader in electronic devices as well as wholesale LED lights..